If you’ve just taking up sewing, you’re going to quickly learn that there are a lot of stitches that you’ll want to learn. Each stitch serves a specific purpose, but some are more essential than others. Of all the different stitches, the topstitch is one of the most basic sewing essentials. A topstitch, as the name implies, is a visible stitch that adds a bit of decorative element to a sewing pattern; in other words, a topstitch is meant to be seen. You can apply topstitching to any type of sewing fabric and project, from chenille blankets to plush toys made out of minky, and from drapery made of jacquard to apparel made of linen or denim and chambray. 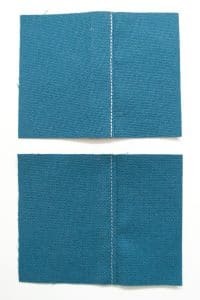 Creating a topstitch is pretty simple; if you can sew a straight line, you can create this basic, yet essential stitch. In this sewing help guide, we’ll teach you how you can create professional looking topstitches with a sewing machine, right from the comfort of your own sewing room. To create a topstitch, you’ll need the right sewing needle and thread. Make sure that the needle that will work with the material you are sewing, otherwise it could damage your fabric. For the easiest option, choose a universal needle. You can choose any color thread; however, we suggest using a color that compliments the fabric, as it will increase the visibility of the stitch. Also, we suggest selecting a heavier thread, which will further improve the visibility and the stability of the stitch. Iron out your fabric before you start stitching. Doing so will ensure that your seams and stitches are as neat as possible. Attach a presser foot to your sewing machine. The presser foot will serve as a guide as you stitch along the edges of the material. If you don’t want to use a presser foot, you could draw a lines in the fabric with chalk or a fabric marker and a ruler; however, a presser foot will certainly make creating your topstitches easier. Decide where you want the topstitch to be placed. Remember that the topstitch is meant to be seen, so you want to choose a spot on the right side of the fabric. Set the sewing machine so that it is on a straight line stitch. Place the material underneath the presser foot; remember that you want the material to be right side up. Begin sewing your topstitch. If the topstitch is going to be along a seam, then ensure that the raw edges along the seam are turned under and concealed before you start sewing. Start sewing. Use even pressure and work slowly so that you can ensure the best results. If you move too quickly – especially if you are just learning – it’s likely that the stitch will look messy, or become knotted or puckered. To ensure the best results, avoid backstitching. Using a backstitch in a topstitch will prevent uniform results; the goal of a topstitch is to have a neat, uniform look.